If you want to go farther off the tee, then consider your ‘smash factor’. That’s a relatively new term. If you swing the club at 90 mph and generate a golf ball speed of 135 mph, you will have a smash factor of 1.5 (ball speed divided by club head speed). By the way, a smash factor of 1.5 is very, very good. The higher the smash factor, the more efficient your swing and the contact is and the better the result you are likely to produce. Smash factor is why you’ll often see a slower swing speed golfer knocking the ball way past a younger golfer with a more aggressive swing speed. Quite obviously, one of the influences on your smash factor is how close to the sweet spot you are making contact. 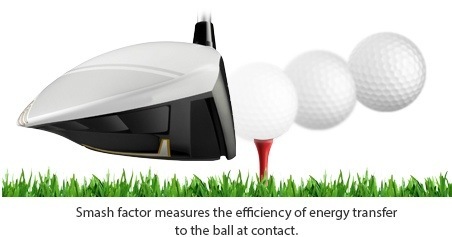 There is a substantial fall off of energy transfer if you miss the sweet spot. But you all know that. The larger faces on Drivers use the face flex to create a larger transfer of energy and to actually increase ball speed. Today, designers are working to make more of the face flex, so that if you miss the sweet spot the energy transfer is still as high as possible. 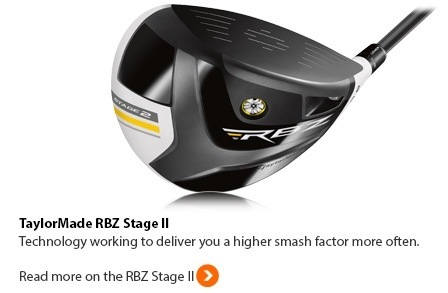 Face flex is one of the reasons to look at upgrading to the TaylorMade RBZ Stage II. It has a truly large face (at 4100mm²). 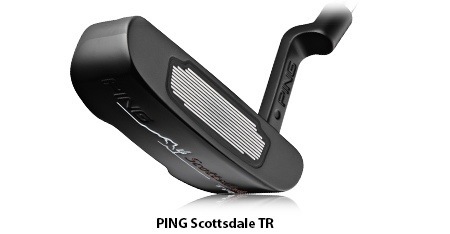 That allows the face, away from the sweet spot, to have more flex and spring. Combined with TaylorMade’s ‘Inverted Cone Technology’ (milled into the inner side of the larger clubface), that means an expanded portion of the face delivers a high smash factor. That means more distance, more consistently. As well as sorting out your setup, your Fitting and the Putter design, please find the golf ball position at address that allows you to bring the Putter back to the ball square to the target line, every time. And then, with great care, set up with the ball in exactly that position every time. If you select a Putter with a different neck design that changes the offset on the face, then it must change the relationship between your hands, the face and the ball at impact. Did you know that one of the solutions for a right-handed golfer who always misses the cup to the right, is to move them to a Putter with more off-set? That allows the face more time to rotate and square. However, beware of simple diagnosis. There are many reasons a golfer could be missing the cup to one side. Our job is to look at your setup, your stroke and your equipment and find YOUR solution to better putting and lower scores. This entry was posted in fitness, golf, golf instruction, golf tips, sports and tagged draw, golf, golf instruction, golf swing, golf tips, LPGA, over the top, PGA, slice, Suzanne STRUDWICK, tour. Bookmark the permalink.